Outside the Icelandic Parliament in Reykjavík, the Minister of Industry is walking the square to attend a meeting when someone calls out her name. It’s a man - wet from top to toe – smelling of gasoline. Before the minister realises what to do the man grabs her and sets fire to both of them. 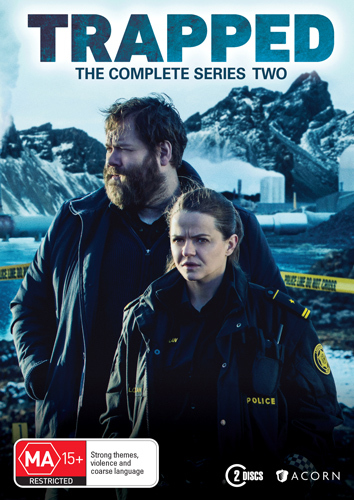 Andri Ólafsson – who now has become the Head of Police Investigation in Reykjavík – goes up north to investigate. This was a murder attempt, but what was the motive? He is also under pressure from the Prime Minister and the Government who think this might have been an act of terrorism – as there are currently some very controversial things connected to an expansion of a power plant near the town of Siglufjörður. 'Trapped' is the highest-rating series ever in Iceland. To celebrate the release of 'Trapped Series 2', we're giving you the chance to take home a copy of your own. Complete your details below. Members can sign insign in at the top of this page to have their details automatically filled in. All fields are compulsory. How do you follow us? Competition opens at 5pm AEST on Sunday 14th April 2019 and closes at 5pm AEST on Sunday 21st April 2019. Five winners will be chosen at random on Monday 22nd April 2019. To successfully win, entrants must fulfil the above entry conditions before the time the competition closes. Current members/followers are eligible to enter the competition. Only one entry per person. Only one winner per household. To be a valid winner, the entrant must not have won a prize from SWITCH within the last 28 days. Each winner will receive one DVD copy of 'Trapped Series 2'. By entering, you agree to receive occasional emails from SWITCH in the future. If you decide to unsubscribe from these updates, any further entries will not be applicable. Only Australian residents are eligible to enter. 'Trapped Series 2' is available on DVD on Wednesday the 17th April 2019 from Acorn Media.